On friday morning, I had to go Fontainebleau, a town about 1 hour south of Paris. On my way back to Paris, I stopped for 45 minutes at the Archives Départementales de Seine-et-Marne (77), in Dammarie-les-Lys. It's easy to find: take the street almost in front of the train station in Melun, and drive for about 5 minutes towards the big Carrefour (one the largest hypermarkets in France). It's on 248 avenue Charles Prieur on the right. The archives are open from Monday to Friday, from 9am to about 4:45pm except Wednesdays when it closes at 11:45am. I understand that the archives will be open 2 saturdays a month as of November (very convenient, train is about 35 minutes from Paris, a drive is about 45 minutes). 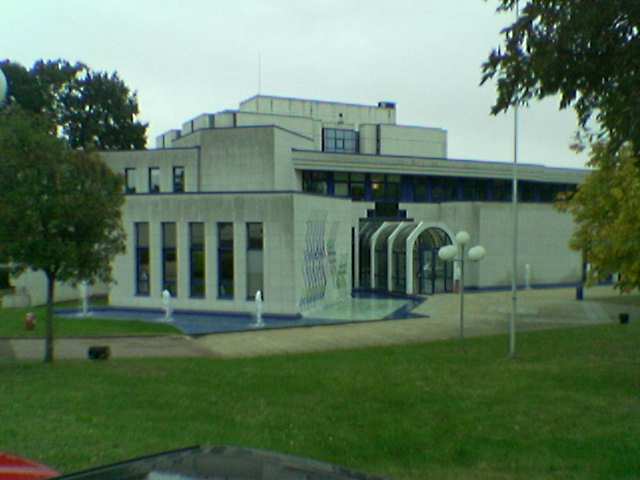 The building is very modern, very similar to other archives in France. Registration is compulsory and is only 2€ for the whole year. Bring an ID card with you. You immediately get a pass and after leaving your belongings in the cloakroom (make sure you know the rules by now: only paper sheets and a pencil in reading rooms in French archives), you get to the Civil Records room. They have done a fantastic job as most of it has been digitized, and you can very easily search on screen, first by Town, then by date, then by folio. The interface is intuitive (you can get the room president to explain to you as well), and there are many computers (I was lucky, the room was unexpectedly almost empty) for you to sit at (about 30). Indeed it took me about 1 minute to find the birth record of one of my wife's ancestors, Gustave LEBEGUE. I knew his precise date of birth (even entry number) as I had found his Legion of Honor file at the French National Archives (in the family someone had given me his obituary which mentionned this distinction). L'an mil huit cent cinquante trois, le vingt septembre, à deux heures et demie du soir, devant nous Héraclius Auguste Gabriel, Comte de Polignac, commandeur de la légion d'Honneur, Maire et officier de l'Etat civil de la ville de Fontainebleau, est comparu le sieur Louis Vincent Lebègue, huissier audiencier près le tribunal civil de cette ville, âgé de trente ans, demeurant à Fontainebleau sur basse numéro quarante trois, lequel nous a présenté un enfant du sexe masculin, né hier à deux heures cinquante trois minutes du matin, au sisdit domicile, de lui comparant et de dame Adolphine Thomas, son épouse, âgée de vingt trois ans, et auquel enfant il a déclaré donner les prénoms Marie Edmond Gustave. Les dites présentation et déclaration faites en présence des sieurs Pierre Charles Eugène Mousselart, huissier, âgé de trente sept ans, et Jean Auguste Hardouin, marchand chapelier, âgé de quarante six ans, tous deux domiciliés en cette ville, témoins qui ont, ainsi que le père de l'enfant, signé avec nous le présent acte après lecture faite. 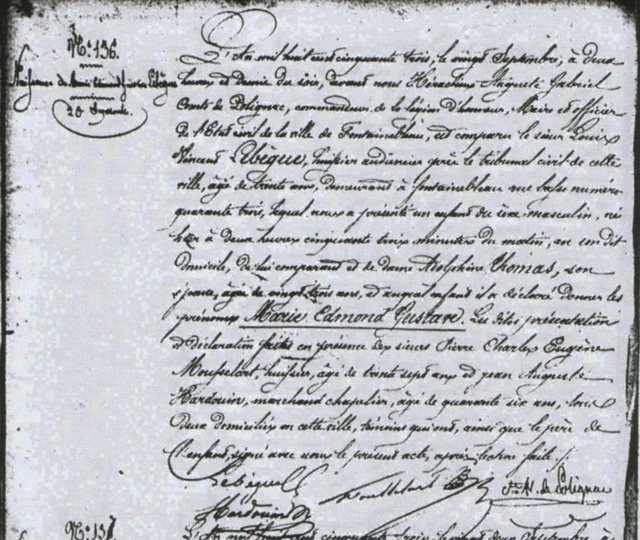 [signatures:] Lebègue LA, Mousselart, Cte A. de Polignac, Hardouin"
Interestingly, I have been researching this man for a while, and during the spring, we dropped by Moret-sur-Loing's cemetary and found his grave rapidly. He is buried with a number of different people. It is very close to Alfred Sisley's grave (its just next to that big tree behind), but is really in bad shape (I had to guess some letters with the finger). Now, I tried to go further up in this branch, but I had no time for further exploration. I think someone told me he was the eldest son, so I tried to find his parents mariage in records between 1850 and 1853: his mother was 23 in 1853, so they should have married around then. I looked both in Moret-sur-Loing records and in Fontainebleau records. Of course the above document only gives the ages of the parents (hence approximative birth year, but not the birth places. A wedding record should have all this necessary information). I also looked for siblings in the birth records between 1853-1855 (information from siblings sometimes allows to narrow down the birth date, and points to additional information). No success. Maybe his parents just moved there for work and were not originally from either towns ? Maybe from another village near by? I'll have to go back and keep looking unless someone has a clue? As you can see, researching just one ancestor can take a lot of time and different paths.